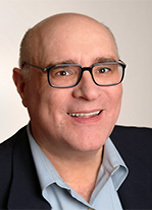 March 7, 2008 -- Chris Barnett's column last week raises a valid point: Everyone talks about the perks and innovations in international business class, but most of us fly coach. There's just one big problem with Chris' undeniable truth: There's nothing to talk about in coach. Coach is commodity class. No carrier courts international coach flyers on anything but price. (The last airline that tried something better, Singapore Airlines, announced this week that it was abandoning its Executive Economy coach cabin on its ultra-long-haul nonstops.) No coach passenger truly believes one airline's back-of-the-bus cabin is better than another's. Worldwide, the difference between airlines in coach can be measured within an inch of legroom, an extra in-flight movie, the odd free drink, the marginally larger overhead bin or seatback monitor. International economy class--and domestic coach, for that matter--is what it is: The class of last and cheapest resort. So forgive me if I part company with Chris here and talk about some new and interesting innovations up front. More than 15 years after it introduced BusinessFirst on international flights as a combined replacement for traditional first- and business-class cabins, Continental is still setting the pace for the front of the bus on two-class airlines. I recently caught up with the latest iteration of BusinessFirst on a new Boeing 777-200ER aircraft flying nonstop between Continental's Newark hub and Mumbai, India. There was much to like. The seats now recline 170 degrees and have privacy hoods. They are acceptably wide at 22 inches and offer 55 inches of legroom. I am not, perhaps, the best judge of in-flight sleeping arrangements. I can sleep on a rock and I actually prefer a well-crafted traditional cradle seat to most of the beds that I have experienced in-flight. I got seven good hours of sleep in this seat. If you need a bed--or think that a chair that converts to a flat bed is now the minimum acceptable standard in business class--I suppose you will disagree with me. Other improvements on the newest version of BusinessFirst: at-seat power ports that accept traditional U.S. or U.K. plugs and a terrific new AVOD (audio video on demand) in-flight entertainment system. The touch-screen system features a 10.6-inch monitor. On my flight, I counted 323 movie options, 174 short programs, 205 CDs and 26 games. Singapore Airlines pioneered the first commercial Airbus A380s last year between Singapore and Sydney and it will soon add the leviathan on a route from London. Most Americans business travelers won't have a shot at flying an A380 until Emirates Airlines launches one on the New York/Kennedy-Dubai route this fall. But details like that never stop Richard Dutchik (below), a Florida-based satellite-communications engineer. I first ran into Dutchik in 1992 when I was editing Frequent Flyer magazine and he was the lone passenger on an American Airlines flight from Raleigh-Durham to Paris. 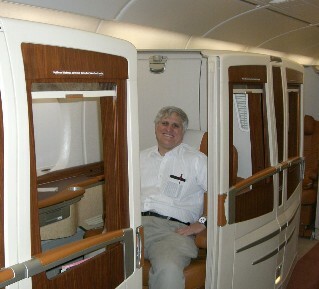 When I heard from Dutchik a couple of weeks ago, he'd already flown in a so-called Singapore Suite, the private, first-class accommodations on the A380. "I'm sort of an airline nut and it was a $6,000 whim," he admitted, explaining that he had upgraded to the A380 and rerouted himself via Sydney when he needed to fly from Singapore to Los Angeles. "It was $4,500 just for the Singapore-Sydney leg," a flight that Dutchik clocked at 7 hours and 30 minutes in the air. So how was it? "The A380 is the quietest aircraft I've ever been on," he said. "I played with everything. They were still having service issues because I flew during the first month. But the pull-down bed and down comforter cover up a lot of problems." Dutchik also felt the suite "is a novelty," but does function well as a work environment. "You can connect your laptop to the 23-inch monitor in the suite and get a lot of work down." Conclusions? "I probably won't do it again because, for the money, Singapore Air's standard business class is by far the better value. But my perception of the suite was that, 'This is my space. I'm in my own little world.' I can't think of any other aircraft cabin like it." One of the least-told tales of business travel is the growth of "alternate" international carriers that offer competitive business-class service for a fraction of the going rate. One such airline is EuroFly, which operates to several destinations in Italy from New York's Kennedy Airport. Once the charter carrier for Alitalia and now controlled by Meridiana, itself controlled by the Aga Khan, EuroFly got a brief burst of attention when it tried all-business-class flights between Kennedy and Milan. That service flopped, but EuroFly now flies Airbus A330-200s configured with traditional business-class cabins to and from Italy. EuroFly sells its C class for about a third of the prices charged by Alitalia and the U.S. carriers serving Italy. And as I found during a recent roundtrip, you can't beat the value for money. You notice EuroFly's economies in small ways--a rudimentary in-flight entertainment system, recycled menu cards--and feel it in a few larger ways: Schedules are limited, advance seat assignments aren't offered and aircraft are sent to a hard-stand at Rome's Fiumicino Airport, which means a bus ride to/from the terminal. But where it counts the most--club access, seat and cabin comfort and meal service--EuroFly stacks up just fine. At Kennedy, EuroFly uses a small lounge in Terminal Four that has a comfortable seating area for complimentary pre-flight meals and snacks. In Rome, EuroFly business-class customers use one of Alitalia's spacious premium-class lounges. It employs a barista so you can have one final espresso before you leave. The business-class cabins are outfitted with just 26 cloth-covered seats. Each has personal lighting and an AC outlet to power laptops. The cradle-style chairs are on par with current transatlantic business-class standards: about 55 inches of legroom, about 22 inches wide, lumbar support, footrests and with a decent recline for sleeping. Passenger loads seem lighter than average and that gives flight attendants plenty of time to attend. And while I never judge an airline by its food, I'd judge EuroFly's in-flight fare to be more than competitive. The wines were interesting and replenished frequently. Finally, turning our attention back home, what are we to make of Virgin America? Launched with obscene fanfare in August after eight years of obscene promotion by Richard Branson, who franchised the Virgin name to the carrier, Virgin America has barely registered on the radar since. After debuting on the traditional transcontinental routes and in the California Corridor, it is now in a dogfight with Alaska Airlines after adding flights to Alaska's Seattle hub. If Virgin has made any impact at all, it is because of its value-priced First Class service on the transcon routes. Tickets in the eight-seat cabins on the Airbus A320s sell for as little as $649 one-way, which is at least 50 percent below the incumbents on the route. Jim Mindling, another business traveler I know since my days at Frequent Flyer, recently hopped a Virgin America flight from Los Angeles to JFK. He sent me the following bullet-point report. The good: seat pitch of 55 inches and a state-of-the-art audio-video system with a large screen. The bad: no lounges; "mediocre" in-flight fare served on plastic dishes with paper napkins; "tiny, and I mean tiny" blankets and pillows; and an "unsophisticated if pleasant" cabin crew that "could not help with simple questions such as how to operate the in-seat massage functions." Mindlings's other observation: "Obviously, the new aircraft with all the incumbent cabin amenities, cleanliness and systems also count for something." So does the much lower up front price.